Mars Polar Lander (MPL) was one of the spacecraft in NASA's Mars Surveyor '98 program. 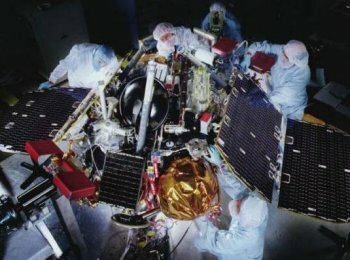 MPL was intended to land on Mars near the south polar cap and, during its descent, deploy two surface penetrators known as the Mars Microprobe Mission. All contact with the spacecraft was lost at the point of separation of the lander and multiprobes, a failure subsequently blamed on shortcomings in project management and preflight testing. MPL was equipped with cameras, instruments (including a microphone to record the first sounds on the planet), and a robotic arm to sample and analyze the composition of the Martian soil. During its scheduled three-month operational period, it was intended to search for near-surface ice, possible surface records of cyclic climate change, and data bearing on the seasonal cycles of water vapor, carbon dioxide, and dust on Mars.